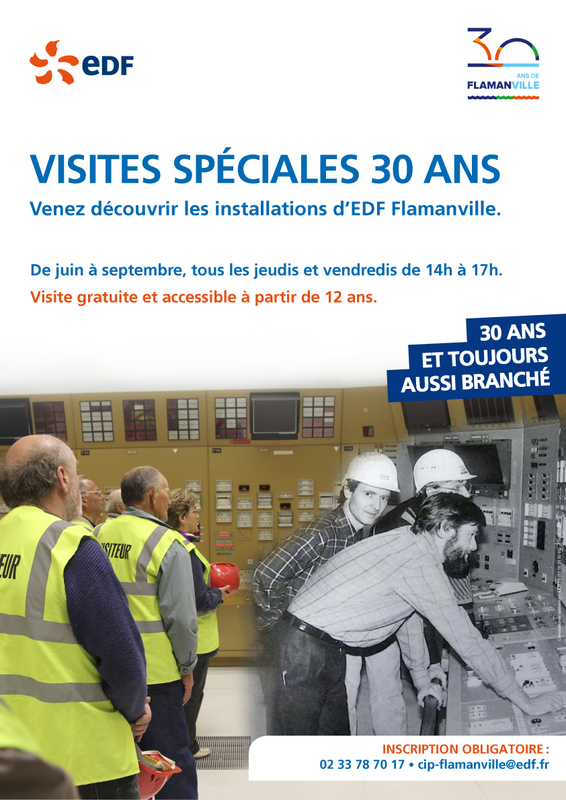 EDF Flamanville nuclear plant is opening its doors for its 30th anniversary! On the occasion of the 30th anniversary of Flamanville nuclear power plant, EDF proposes the discovery of the plant with organised visits every Thursday and Friday from 24 June to 16 September 2016. Relive the history of the cap de Flamanville and the 30 years of plant operation from its construction right up to present. You can learn all about the history and track record of the Flamanville site and operation of a nuclear power plant at a presentation conference. You can then visit the plant and relive successive site developments occurring over time. These visits are free and accessible to everyone over the age of 12 with prior enrolment and presentation of valid proof of identity. For further information and to enrol, please contact the Flamanville Site Public Information Centre on 02.33.78.70.17 or by e-mail at cip-flamanville@edf.fr.